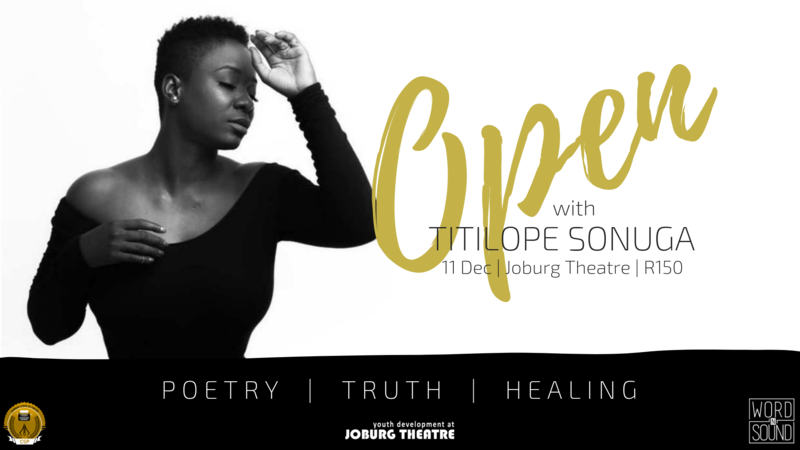 On 11 December, Johannesburg will finally get the chance to experience Titilope’s showcase ‘Open’ which has been gracing stages in Canada, Nigeria and the UK. What are you looking forward to the most during your stay back in South Africa? I’ve been to South Africa several times before, I spent months living in Cape Town as a part of an artistic residency in the same building as Chimurenga Magazine. I even visited Johannesburg and Cape Town for the Christmas holidays as recently as last December. I have a love for both cities and my experiences within them, but I have never performed a full-length show in South Africa and I am just really excited about the experience of placing my work in a brand-new context. I’m really looking forward to meeting new people and sharing in their stories and the opportunity to tap into the amazing poetry community in a way that I haven’t been able to before…and also the food! It is always central when I visit anywhere at all. A poet at a Presidential inauguration is ideally an amazing opportunity for poetry but on the ground in Nigeria, do you believe anything shifted? I think it was a pretty amazing consideration to have a “performance poet” at the Inauguration. Nigeria is a nation of storytellers. To have been chosen is something I consider a great honour. The shifts are there but they are slow. I think poets doing their own individual work in their own spaces has done more to shift the culture and elevate the craft than my one-time inauguration performance. Considering your time in both Nigeria and Canada, what are the highlights of each poetry scene? There are so many similarities within poetry communities no matter where you are. Each scene just happens to be in a different growth phase. Both places are coming around to the commercial value of poetry over and beyond open mics, you’re seeing poets in brand new arenas, securing the bag (as we should) but also creating revolutionary art and pushing conversation. I would say the Canadian scene is more structured giving artists better access to resources both financial and otherwise to pull off their ideas. Nigeria has a pulse in that everyone is out there just pushing their hustle and doing it for themselves. That is very exciting to me, seeing what we are able to manifest with almost no help. Has living in two countries affected your writing in any way? Absolutely. But I am me no matter where I am so my writing is always oriented by what is in my heart at the time, no matter my location. Are you familiar with any South African poets? If yes, whose poetry are you fond of? Yes! Raphael D’Abdon, who I met many many years ago at a performance at Brown University for the Chinua Achebe Colloquium on Africa. Natalia Molebatsi, Lebo Mashile, Koleka Putuma all brilliant brilliant women who I consider friends as well as sisters, who have also been to Lagos as part of the Lagos International Poetry Festival. Vangi Gantsho! I mean, I really could go on. These are all poets I know personally, but lots more that I have crossed paths with along this journey. All brilliant minds. And if you had to suggest a Nigerian meal to someone who has never had Nigerian food, what would you suggest? If you want to do it right, you have to start with pounded yam (and egusi, or efo riro, or really any soup because they are all amazing). If you’re trying to jump in gently maybe Jollof rice, but the variety of dishes is so vast that I feel that would be cheating yourself. Catch Titilope live at the Joburg Theatre on 11 December at 7PM. Get more info and purchase tickets here.